Built in 1928, the Fullerton Building was the centre of Singapore’s commercial, social and official life (and the area around it – Fullerton Square – a political centre with election campaign rallies took place during the 1950s for office workers in the area). 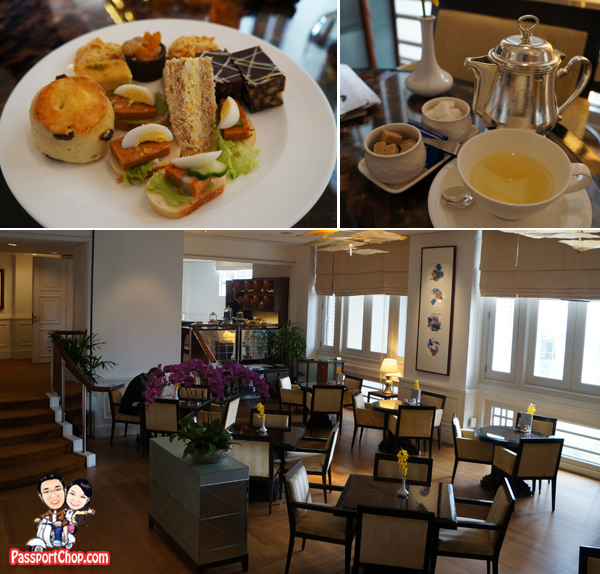 Thus, it was quite an experience to be doing a staycation at the Fullerton Hotel Singapore with such rich heritage and interesting history and at the same time enjoying the luxurious facilities – to put it simply – a luxurious learning experience! The Fullerton Heritage Guided Tour is a perfect complement to our staycation as we got to better understand the evolution of the hotel’s site from a defensive fortification (Fort Fullerton) to a General Post Office to government offices and eventually the Fullerton Hotel (and the transformation into Singapore’s landmark hotel was quite recent in 2001 after a S$400 million restoration). Named one of Travel + Leisure’s 500 World’s Best Hotels in 2013 and a Conde Nast Traveler Gold List Hotel for the seventh year in 2013, The Fullerton Hotel Singapore is an inspiration to all who pass through her doors and a perfect example of how Singapore’s built heritage can be protected and restored and yet provide highest levels of luxury and technology in this hotel. The Fullerton Hotel has about 400 rooms and suites which either overlook the sunlit atrium courtyard, or have balconies that open out to sweeping panoramas of the city skyline, river promenade or sea. The number of room categories (from the Post Master Room with scenic views of city skyline to Heritage Rooms which reflect the distinctive character of the building with historic architectural cornices and original motifs from 1928) is one of the most I have seen in a hotel and illustrates how well the Fullerton Hotel had managed the balance between preserving the rich heritage and providing stylishly chic accommodations. During our staycation at the Fullerton Hotel, we stayed in one of its Loft Suites as part of the Fullerton’s Suite Dream package. At 1173 square feet (or 109 square metres), the Loft Suites are distinctive two-storey duplex suites that make full use of the high ceilings, from the time the Fullerton Building served as a General Post Office, to create a sense of spaciousness in the room and yet provides guests with discreet privacy. From the living room on the lower floor, a spiral staircase leads to the bedroom above, ensuring that the bedroom remains your private domain while business discussions or friendly get-togethers take place in the living room. If you have here on a family staycation or holiday with kids, your children can also bunk in at the pull-out sofa bed on the lower floor. The Loft Suite offers a great view of the Marina Bay waterfront and if you are here during F1 race season in Singapore, you will also be able to catch the racing action at one of the most exciting turns of the circuit – the Fullerton Hairpin! And the best part is you can catch all these actions from the comfort of your bed through the original double storey French doors! The Pillow Menu at the Loft Suite offers a wide selection of different pillow types from Contour Neck Pillow, Latex Pillow, Micro-Gel Pillow, Tempur Pillow, Tatami Pillow and even Jade Pillow! Perfect for guests who require firmer pillows than the usual feather pillows provided by hotels. As for the bear in the picture below – it is one of four collectible Fullerton teddy bears (and one of them is a panda bear). They are dressed in the postman uniform (a symbol of Fullerton Building’s heritage as a General Post Office) and other uniforms that represent the Fullerton Hotel’s past and present. Part of the proceeds from the sales go to the charities i.e. MILK Fund and WWF-Singapore. The living room of the Loft Suite opens out to a magnificent verandah flanked by 20-foot Doric columns on each side, and offers stunning views of the Marina Bay waterfront and a part of the Anderson Bridge which marks the hairpin turn of the Singapore Grand Prix street circuit and The Fullerton Waterboat House (another conserved building which is part of the Fullerton Heritage). As part of the Fullerton Hotel Suite Dreams privileges, guests can enjoy luxurious accommodation in a Loft Suite with a welcome bottle of wine. Guests are also provided with a pair of personalised Fullerton bathrobes (with their names inscribed on it)! 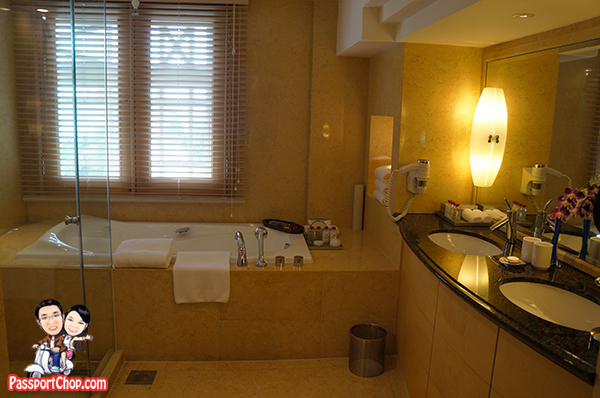 The bathrobes are folded nicely and packaged in a gift box on your bed during your check-in. A selection of bubble bath flavours and candles are also provided as part of the Suite Dreams privileges – perfect for a romantic staycation. The bathroom/toilet is on the upper floor and has quite a spacious vanity area (with his and her’s sinks) and separate shower and toilet cubicles as well as a spacious bathtub. Bvlgari bath amenities are also provided. The slight inconvenience of staying in the Loft Suite is that you will have to climb the flight of stairs up to the toilet and you will also have to bring your day bag (for your staycation) or luggage up to the bedroom for unpacking. 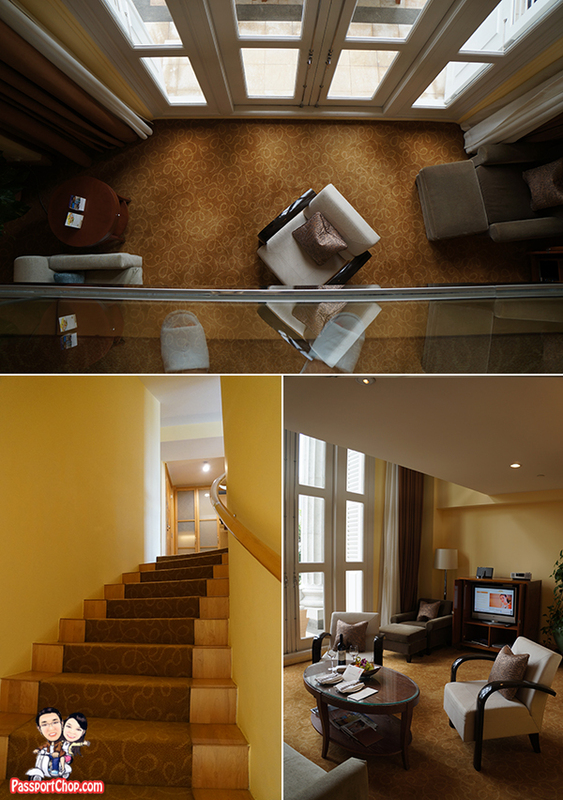 There is however an easier way – the entrance to the lower floor of the Loft Suite is on the 2nd floor of the Fullerton Hotel; guests can take a lift up to the 3rd floor and enter through the door on the upper floor to reach the bedroom! 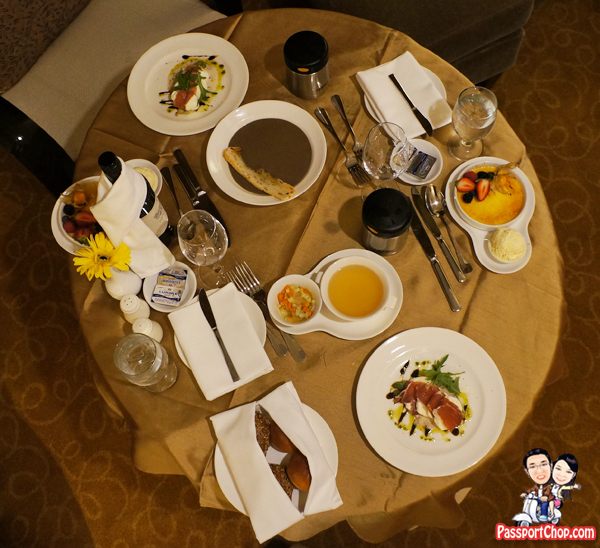 A Four-course in-room dinner for two persons (per stay) is also included as part of the Suite Dreams package – do note that there is a fixed menu to select from (you will have to call room service to check the menu; the Suite Dreams package menu is different from the in-room dining menu in the suite) and the food selection is quite limited. The selections available during our staycation were: (please note that the menu is subject to change) Parma ham for appetiser; Clear or Mushroom soup; Beef steak or Salmon for main course; Creme Bulee or Tiramisu for dessert. Bread rolls and a bottle of wine are provided as part of the dining package. Another Suite Dreams privilege is exclusive access to The Straits Club for two persons; inclusive of Champagne breakfast. 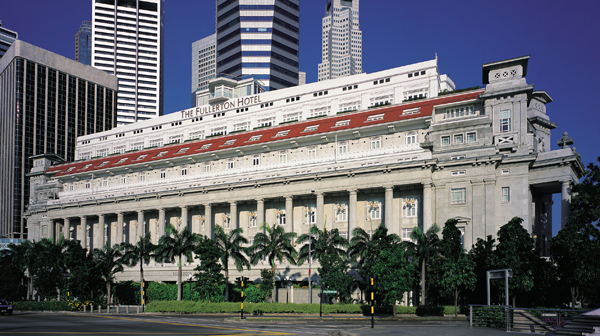 The Straits Club is The Fullerton Hotel Singapore’s premier executive club. Offering personalised service and a private check-in experience, The Straits Club pampers its guests with luxurious amenities and thoughtful service. With a soaring ceiling and vintage Peranakan decor featuring Straits Chinese artefacts, The Straits Club Lounge exudes a warm ambience of understated elegance and luxury. Guests may enjoy complimentary daily champagne breakfast, an exquisite array of refreshments throughout the day and elegant evening cocktails and canapés. Afternoon Tea at the Straits Club is from 2.30pm to 5.30pm. Guests can enjoy a selection of English Tea Sandwiches, Homemade Scones with Clotted Cream and Jam and assorted French pastries. Personally, I loved the mini otah sandwiches! The Straits Club also has an impressive ‘TWG Tea’ selection menu of over 13 different types of tea! 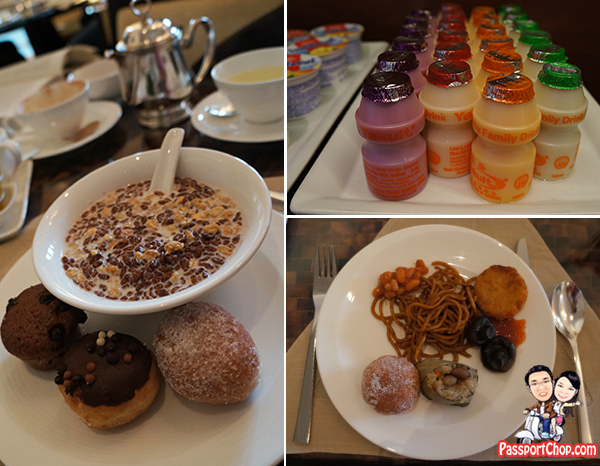 Breakfast at the Straits Club – there are even Yakults! Scrambled eggs, omelettes are made to order so you get freshly cooked egg dishes and they are delivered straight to your table. The buffet selection is also quite extensive – one of the more impressive spread I have seen for breakfast at a hotel club/executive lounge. There is quite a range of DVDs available for loan (maximum of 2 per day). Time to catch up on some old movies you might have missed from the DVD players in both the Loft Suites’ upper and lower floor TVs! Food, movies, great waterfront views, comfortable pillows – these are what makes up an excellent staycation at the Fullerton Hotel. 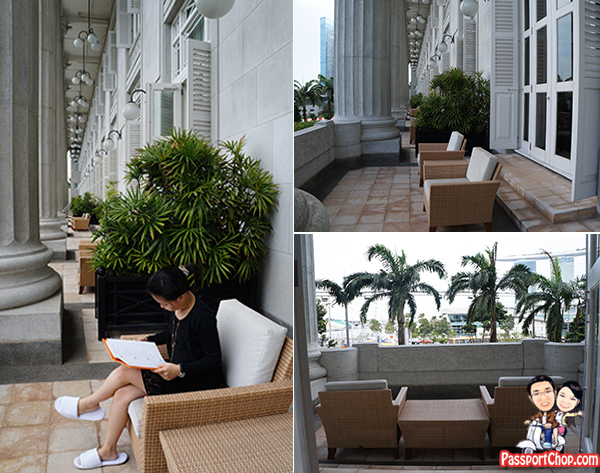 The Fullerton Hotel Singapore features modern facilities for the fitness conscious. 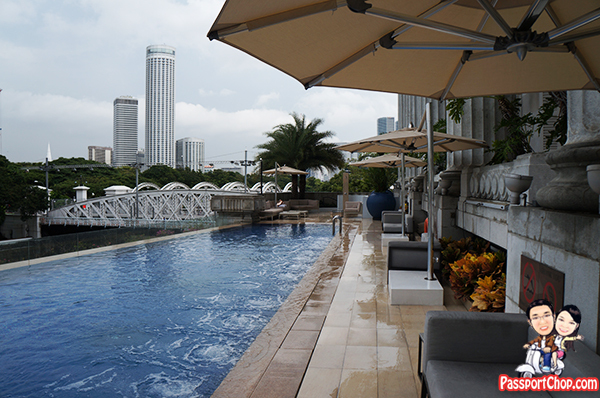 This includes a 25-metre outdoor infinity pool overlooking the scenic Singapore River, making it the perfect place for a relaxing swim. The pool is open daily from 06:00 to 23:00. A state-of-the-art Fitness Centre ensures guests will keep trim with the latest equipment. The Fitness Centre is open 24 hours daily. As part of our commitment towards showcasing the unique history of The Fullerton Hotel Singapore, the Fullerton Hotel had introduced a complimentary Heritage Guided Tour to in-residence guests of The Fullerton Hotel and its sister hotel, The Fullerton Bay Hotel Singapore, on Mondays and Thursdays from 10.00am to 11.00am and Saturdays from 5.00pm to 6.00pm. Led by the hotel’s guide, The Fullerton Heritage Guided Tour will take you on a journey to several historical points of interest within and around The Fullerton Hotel including the former main entrance of the General Post Office, Post Bar (where a 300-feet long postal counter used to be), the Straits Room (formerly the Billiard Room of the prestigious Singapore Club) and The Lighthouse (The Fullerton Hotel’s Italian restaurant which used to house a beacon that guided ships approaching Singapore’s shores from 1958 to 1979). Interested in-residence guests can contact the hotel’s Concierge desks to register. For me, the Fullerton Hotel Heritage Guided Tour was an excellent learning journey – thanks to our guide Ms Florence Minjoot who was very informative. There were lots of interesting nuggets of information on amazing architectural design that were preserved during the restoration e.g. 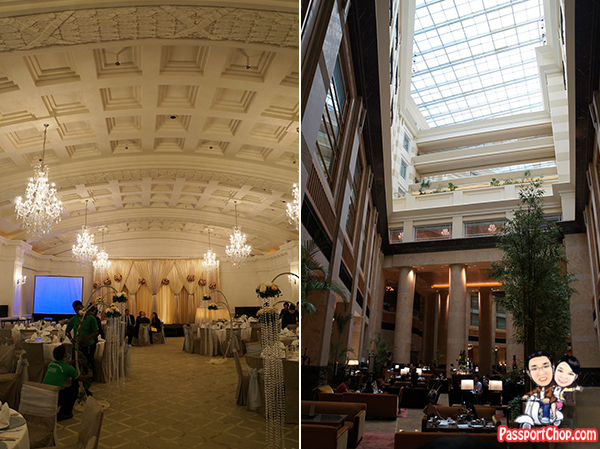 the Straits Room’s unique barrel vaulted ceiling (see bottom left picture) – the only one of its kind in Singapore now and stories of how it was ‘rediscovered’ when the Inland Revenue Authority of Singapore occupied the room. Other interesting information include how the hotel’s central triangular sky-lit atrium came about (see bottom right picture). The Fullerton Building was designed for natural ventilation before the age of air-conditioning; one of the architectural devices used to provide this was the internal air-wells. There were four air-wells along the central longitudinal axis, divided by three internal bays of offices, linking the front façade with the rear. It was the largest and the last example of this kind of architecture in Singapore. As air-conditioning became increasingly common, the air-wells became redundant and the roof with the air-wells has since been converted into clear windows providing the atrium with natural lighting. 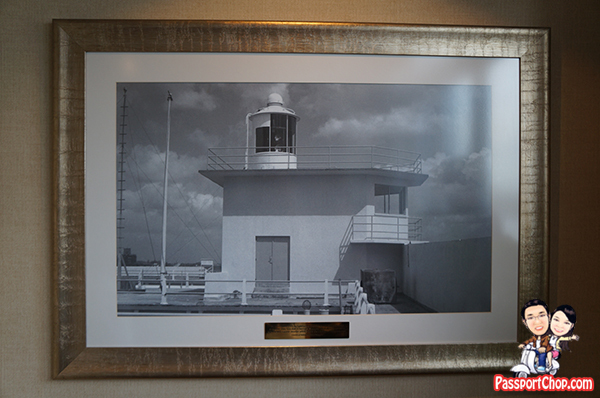 Did you know that The Fullerton Building used to have a lighthouse? The Fullerton Light, a revolving beacon of 540 kilocandelas mounted on the roof of the building, was installed in 1958 to replace the Fort Canning Lighthouse which was being demolished. The beacon could be seen by ships 29 kilometres (15.7 nautical miles) away. The Lighthouse Restaurant & Rooftop Bar now occupies the exact location where a beacon used to guide the world’s mariners to the safety of the Singapore port in the eighteenth century. 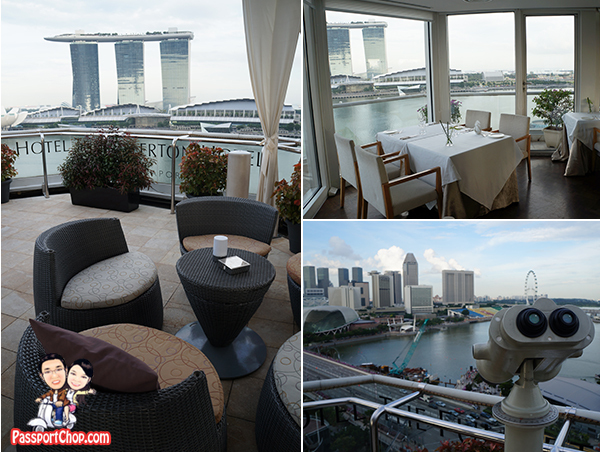 Today, it offers a lovely ambience and commands one of the most mesmerizing views of the city skyline and Marina Bay waterfront from atop The Fullerton Hotel. Dining at The Lighthouse Restaurant or enjoying quality wines and tapas at the Rooftop Bar, guests can enjoy nightly views of the Marina Bay Light Show as well as the city’s spectacular fireworks display on New Year’s Eve. The Fullerton Heritage Guided Tour ended at the Fullerton Heritage Gallery. This gallery showcases the rich heritage and history of the hotel with an exhibition of old photographs and philatelic materials dating back to 1932. If you are a history geek like me, walk through the exhibits to supplement the information you picked up during the tour – you can see the evolution of this Fullerton site throughout the years! 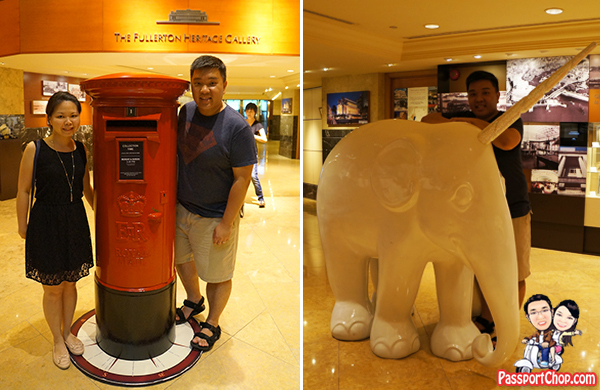 You might be wondering what is a white elephant-unicorn statue (see bottom right picture) doing here at the Fullerton Heritage Gallery – this isn’t Singapore’s new mascot but part of a art display in the Fullerton Heritage Gallery. Besides being a permanent space dedicated to the history and culture of the precinct, the Gallery is also an exhibition space for visiting art exhibits from local and overseas artists. The Fullerton Heritage Gallery is open from 10am to 10pm daily and admission is free. Well-positioned in the heart of Singapore’s Central Business District, the Fullerton Hotel is within walking distance to the cultural centres of Victoria Theatre and Concert Hall, the Asian Civilisations Museum and the Esplanade – Theatres on the Bay as well as Boat Quay, one of Singapore’s most popular dining and entertainment belt. The Merlion, Singapore’s national icon is located just across the road at One Fullerton, a waterfront dining and entertainment complex, linked to the hotel via an underground travellator. The shopping hub of Suntec City Mall and Marina Square are a leisurely 15- 20 minutes walk towards the direction of the Esplanade – Theatres on the Bay. The Raffles Place MRT station is just a few minutes walk from the Fullerton Hotel, providing ease of access to several key locations in Singapore e.g. the Orchard shopping belt (via the Orchard MRT station). The Fullerton Hotel also provides complimentary shuttle services to Singapore’s key business buildings and main shopping belts. i can say your blog is very nice, with good information i saw some thing new in your post. Hello, was this a sponsored stay? I every time spent my half an hour to read this weblog’s posts all the time along with a cup of coffee. Great post, thank you for making the effort to detail you stay so well. Just to check if the straits room access, includes the complimentary breakfast, lunch, dinner , or they are of additional charges. The Straits Club privileges includes round-the-clock personalised service, in-room registration, a complimentary daily Champagne breakfast, afternoon tea, evening canapés and cocktails in a dedicated lounge with a vintage Peranakan decor featuring Straits Chinese artefacts.